I take a sketchbook with me everywhere I go, even if I'm just heading to the gas station to refill the tank. I had lovely thoughts to share about keeping a sketchbook and how pivotal this is for anyone with artistic ambitions or creative hobbies. But then, my husband went outside to change the brakes on our car, leaving me to write out my lovely thoughts in the midst of a storm of children, which storm has blown my concentration right out the door. The teenager is writing a physics paper and packing for an overnight field trip tomorrow. The middle child is sick and needs medicine and love. The baby has torn his diaper off so many times, that I am now letting him sit naked on my lap and watch Jay Jay the Jet Plane while I type. I may not retrieve those lovely sketchbook thoughts till another day. Just know that the thoughts are there. 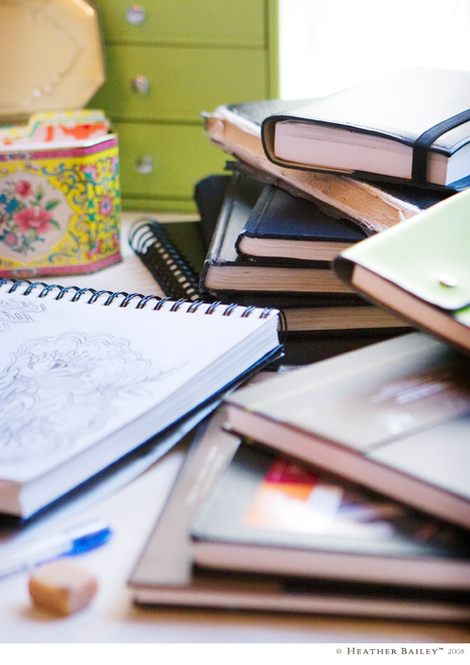 I am passionate about sketchbooks. You must, must, must have a sketchbook—so I went and got one for you, along with a big pack of pretty, colored pencils. It doesn't matter if you can draw. You need a place to capture your creative brainstorms. Write it down, draw it out, or risk losing it. I also picked up a colored pencil blender pen for you, a solvent-based marker meant for blending wax-based colored pencil pigments. This is something I have never tried before, so I got one for me too. We'll find out together. If I'm preaching to the choir, and you're already amply equipped with sketchbooks and colored pencils of your own, take a shot at this giveaway anyhow. If you win, then you can gift the prize to a creative friend who needs to hear the gospel truth about sketchbooks. As you know, I have some big introductions to make this week. I tidied up my sewing area this morning to make way for a full weekend of projects—assuming the baby keeps his diaper on and no unexpected strike-offs arrive at the door. Just going with the flow. I'm grateful to have that flexibility. Speaking of flow... I better go put a diaper on this kid. I'm testing my luck at this point. I'm am all about art supplies. I love nothing more than to sit at my drafting table with a fiesta of colorful paints, markers and tools within reach. It's also handy to have a few supplies that are easy to pack up and take with me for long family functions, for travel, or even for a trip to the park with the kids. One of my all-time-favorite, easy-to-pack art supplies is my compact set of Winsor Newton watercolor half-pans (the official name for these little dried cubes of paint). I love to work with pan paints on the go. And each half-pan can be replaced as it is used—without having to get a whole new set of colors. In fact, you can swap the colors around, add new ones, remove a few, and make your own custom palette to paint with. The teensy-tiny box opens up to reveal plenty of palette surface for mixing colors. 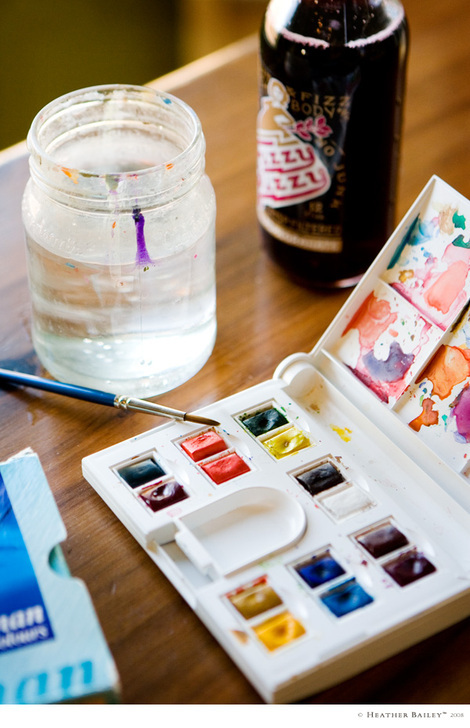 There is even a little water tray for plein-air painting. (I don't use the water tray myself. I'm happy to bring a larger cup along.) Also included is a small, round paintbrush which is stored inside the compact. These pan paints don't offer the same pigment depth as top-of-the-line tube paint, but they are a good quality for a traveling set. 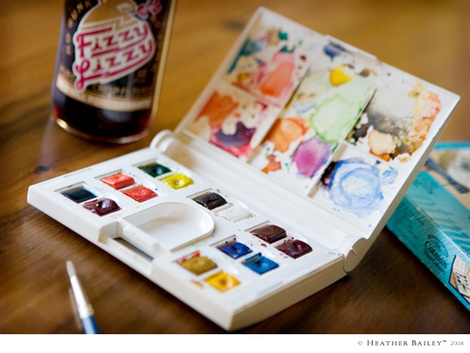 And this little box of watercolors has remained one of my favorite art supplies over many years. You might recall my March of the Tools post on these from a few years back. Today's lucky winner will receive a new Winsor Newton compact watercolor set to call her own, the same traveling kit that I use. A $38 value. Comment to enter today's giveaway. One entry per household. Be sure to include your email address so we can contact you if you win. You don't have to type your email address into the body of the comment if you entered it in the email-address field on the comment form. Today's giveaway will close at 11:59pm PST on Tuesday 8/27/13—which means it will overlap with Day 25's giveaway and Day 27th's giveaway, so don't miss those. Watch for the winner to be announced within the week at the bottom of the post. For more info on my August giveaway party, click here. Please share the word. Check back every day. At Quilt Market last May, I met Nathan and Stacy Wiedenmann who were there introducing a new product to the world. And it was no elementary, homespun product either, but a multi-function task light of all things. Now how do you get that made? The inventor in me can't resist new gadgets. The business owner in me thrills to see someone tackle manufacturing with success. Isaac has two pet lighting inventions he wants to patent and market one day, so meeting small business owners in the lighting trade is extra fun. Now, I'm going to butcher the Stella Lighting story, but as I understand it, Nathan was at a meeting at Starbucks where he and an associate were discussing a prototype of this lamp when a quilter approached them to find out more about it. After a demonstration, she insisted that she needed the lamp and she needed it now. And that other quilters and crafters needed it too. The punchline is: this godsend matchmaker hooked up a great little lamp with an eager audience and it was true love. So what makes this light different? The Stella task lamp is stocked with 21 little LED light bulbs, all rated to last for 50,000+ hours—we'll call that a lifetime of use. You never have to change the bulbs. With efficient LED technology, the lamp uses 10% of the electricity of a comparably bright incandescent light. And the light stays cool, so you can work right under it very comfortably. It is available as a desk lamp or floor lamp. It also has five brightness levels, so it can be adjusted to the task at hand. You can choose from three different light temperatures, including a warm light (very similar to incandescent light), a very cool light, and a bright, daylight-balanced light. For me and my purposes, the daylight-balanced setting is where it's at. Much of my work involves reviewing colors for accuracy. And having a Stella on hand allows me to work later into the day, after the sun has set—perfect for evaluating fabric strike-offs, painting new artwork, or choosing thread colors. The light is even and bright and the neck of the lamp can be bent in almost any direction. 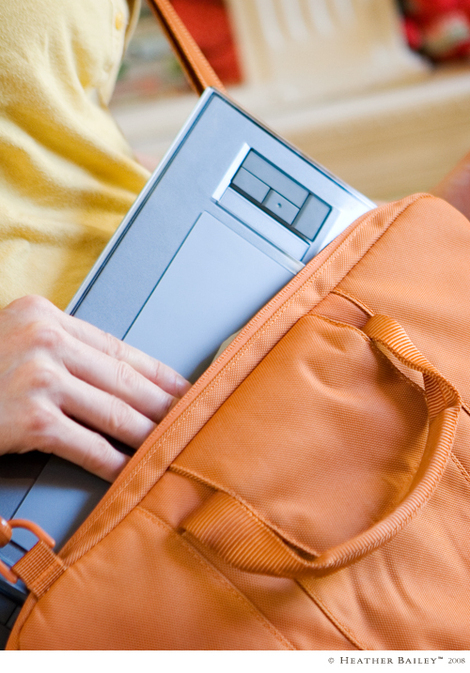 It's streamline shape allows it to peek in quietly over your work or move aside as needed. Check in with Stella on Twitter and Instagram. Visit StellaLighting.com for a video introduction and more information about the product and the company. Art stores, quilt stores, needlework stores and more are all starting to carry this new light, so watch for the Stella at your local shop. Stella Lighting is generously donating one white Stella task lamp for today's giveaway. A $220 value. Comment to enter. One entry per household. U.S. shipping only on this one. Be sure to include your email address so we can contact you if you win. You don't have to type your email address into the body of the comment if you entered it in the email-address field on the comment form. Today's giveaway will close at noon PST on Tuesday 8/20/13. Watch for the winner to be announced within a few days at the bottom of the post. For the backstory on my August HELLO Giveaway project, click here. Please share the word. And check back every day. When I say that I'm friends with some cool people at some cool companies. I mean, wow. I put out some calls, told everyone I wanted to have a big Thank You Party for my readers, and look what's coming in. Today's giveaway prize is another big one. This incredible machine here is called the Cricut Expressions 2. It is an electronic cutting machine. Digital designs are plugged into the system on cartridges and out come perfectly-cut pieces. Pieces of what, you say? Pieces of cardstock, chipboard, sheet magnet, foam, felt, balsa wood, vellum, cling vinyl, fabric and more. That's a lot of creative possibilities. This Cricut is a free-standing machine that is easily operated using touch-screen technology. You don't have to have a computer. From what I read, this is one of the easiest cutting machines to operate and there are a number of video tutorials and reviews posted online if you're a visual learner. Included with the Expressions 2 machine is their Cricut Essentials cartridge which includes hundreds of designs and a Cricut Alphabet cartridge. Beyond that, Cartridges galore are available separately from a variety of designers. The machine features a cutting area as large as 12" x 24" and it will arrange multiple items for you in order to prevent waste. Great for crafts, party decorations, card-making, scrapbooking, fabric applique, product packaging, valentines. I can think of so many fun things to do with a cutting machine. What incredible technology to have on hand. Oh! And Cricut is also including a bundle of iron-on vinyl in three colors—winner chooses the colors. Wait till you see what you can do with this iron-on vinyl. Holy cow. You can customize tee-shirts, pillows, shoes, sports jerseys, hats, handbags, Christmas stockings—anything. To see images of this heat-transfer film in use, visit Cricut's iron-on vinyl product page, then click on each color of vinyl to pull up project ideas. With so many functions and uses, it's quite impossible for me to cover it all in this one post. I recommend you visit their "New to Cricut?" page, the Cricut Blog, and the Cricut Forum if you want to delve in to the details and see all that the Cricut Expressions 2 can do. Cricut is also on Facebook (a great resource), Instagram and Twitter, so go say hello. All in all, today's generous prize is a $345 value. Thank you, Cricut! To enter for today's giveaway, leave a comment here on this post. One entry per person. Be sure to include your email address so we can contact you if you win. You don't have to type your email address into the body of the comment if you entered it in the email-address field on the comment form; I can access that info from behind the scenes. Today's giveaway will close at 11:59pm PST on Sunday 8/18/13. (This is a big one and it's Friday—so I'm giving you all weekend to enter. This means it will overlap with Saturday's and Sunday's giveaways.) Watch for the winner to be announced early next week at the bottom of the post. For more info on these August HELLO Giveaways, click here. Please share the word. We have lots more in store for you this month. Giveaway Day 14 — Art Supplies! Art supplies! Who doesn't love to collect art supplies!? I'm incredibly excited to share today's prize with you. Copic has generously contributed a set of their Ciao Too artist-quality markers. I've been researching markers heavily all year and Copic stands tall at the top of the list. Not only does Copic offer their markers in scores of colors, with a variety of nibs to choose from, but Copic markers are also refillable and blendable. That's right—blendable. The ink flows smoothly and colors can be blended together without glaring streaks or stripes. They make several styles of markers which hold differing amounts of ink, but follow the same color system. The Ciao markers here come with a brush tip on one end and a chisel tip on the other. With some product lines, you can choose which nibs you like best and swap them out as you see fit. Most of their markers are double-ended—except for the super-duper wide ones. One popular style, the Copic Sketch marker, can be attached to their proprietary air-brush system where colors swap out easily and there's no fussy clean-up. I'm just mesmerized by these. Like every product I'm including in the giveaways this month, I contacted the company because I genuinely love what they do. I have been fawning over this prize ever since it arrived at the studio on Monday. Someone is going to be one lucky duck. Copic markers are top-of-the-line. They don't come cheaply, but they do their job fantastically and they maintain their value quite well. With refillable alcohol-inks and replaceable nibs, these valuable tools can be used in perpetuity. They work great for fabric studies and that works for me. I love them. So, here's your chance to get hooked on these amazing markers too. Today's winner will receive this 24 pack of Copic Ciao Too markers. A $130 value. Thank you, Copic! Follow Copic on Twitter, Instagram, Facebook and the Copic Marker blog. 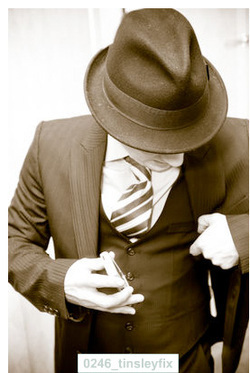 In fact, check out the Gallery on their site for inspiring artwork and artist interviews. Comment to enter today's contest. Be sure to include your email address so we can contact you if you win. You don't have to type your email address into the body of the comment if you entered it in the email-address field on the comment form; I can access that info from behind the scenes. Today's giveaway will close at 11:59pm PST on Wednesday 8/14/13. One entry per person. Winner chosen at random using the random number generator at Random.org. Watch for the winner to be announced within a day or two at the bottom of the post. For more info on my August HELLO Giveaways, click here. Please share the word. Check back every day. Today's giveaway is from my friend, Katie Richardson, who invented this crazy-cool folding baby tub and quickly expanded her business, Puj Baby, to include several other hip and helpful products for families. Katie is good friends with Isaac's sister, Maureen. She and I have met up a couple of times and every time I see Katie she's reached new heights in design. I'm incredibly impressed with her and her success. I discoverd the Industrial Design program at my university when I was just about to graduate in Apparel Design. I have kicked myself ever since for not learning about it sooner. At one point, after I had abandoned my plan to pursue Medicine, I had hunted for a degree that would lend itself to animatronics (mechanical puppets and special effects for the movies, that kind of thing). I wanted to know how to make anything and everything, sewn items on through to electronics. I am still mad that the Industrial Design program never came up on that hunt. I had grouped it in with Civil Engineering and passed it right by. If I could do college again, I would major in Industrial Design and minor in Apparel Design. The inventor in me still craves that education on materials and processes. Perhaps I can find a program somewhere yet and scratch that itchy itch. My point is that Katie here majored in Industrial Design. As did her husband, Ben. And look what they have created! Isn't this impressive? Together they are a design power house. And I can't wait to see what they do next. You can too. Follow Katie and Ben's journey on their company blog and on Katie's "Secret Blog"—I sure hope it's not a true secret—Katie? Puj Baby can also be found on Instagram and Twitter at @PujBaby and on Facebook as well. Check them out. Without further ado, today's giveaway prize is a generous bundle of amazing inventions from Katie and her company, Puj. Winner will receive one Puj Tub, one Puj Hug baby towel and Puj Nubs, knobs to hang your Puj products on. A $90 value. By the way, the Puj Hug towel fastens gently around mom's neck so she can get baby from the tub more safely—without fuss. Or dad's neck. See how this works at Puj.com. I love inventions! I know some rad people. Comment to enter today's contest. Be sure to include your email address so we can contact you if you win. You don't have to type your email address into the body of the comment if you entered it in the email-address field on the comment form; I can access that info from behind the scenes. Today's giveaway will close at 11:59pm PST on Tuesday 8/13/13. This one requires a U.S. address. And they can't ship to a P.O. box. Watch for the winner to be announced within a day or two at the bottom of the post. Don't you just love when you're working along, having an normal-sort-of-day, and the postman shows up with a box of sunshine. Today I'm restocking my gouache supply. Not with onesie-twosie-tubes, here and there, but with all 84 colors in this particular range. I'm amping up for major output this year. In my years of ordering art supplies online from all over, I don't think I've yet seen such meticulous packaging. I tore into the bundles like it was Christmas. It took me a good 20 minutes to free the tubes. Yum, yum. Now where to keep them? I have a little baby here who would just love to sink his teeth into each one of these tubes, take the lids off, bust open the tails and squirt color everywhere. Come to think of it, that sounds just about right. You asked about the pencil shown in this post? This handy tool is called a drafting lead holder or clutch pencil. It contains a thicker core of lead (2mm) than a mechanical pencil (0.05mm to 0.09mm) and must be sharpened with a specialized device called a lead pointer. Pencil lead is manufactured in a range from soft to hard, with "B" representing a soft lead and "H" representing a hard lead. B stands for "Black" and H stands for "Hardness." As such, a soft lead produces a darker, thicker line and a hard lead produces a lighter, thinner line. The full spectrum is represented below in an image from Dave's Mechanical Pencils. The more B's a lead has, the softer it is, the more H's it has, the harder it is. Your typical school pencil or mechanical pencil uses an HB lead, which is dead in the middle between soft and hard. (A "#2 pencil" is the same as an HB pencil.) However, for my artwork, I prefer a harder lead which is less dusty and won't smear as readily. A harder lead keeps its point longer as well. However, with a hard lead, artwork isn't as black on the page as with a softer lead. For me, this is an easy trade-off. I use a softer-leaded pencil to lead up the back side of tracing paper in prep for transferring a design, but for all other pencilly purposes, I prefer a hard lead. I'm a huge fan of mechanical pencils as well and I use them plenty, especially when I'm on the go. Most stores carry the standard HB leads for mechanical pencils. However, it takes some planning to procure those ultra-thin leads in a harder variety. You can find them online or at nicer art supply stores. When I'm at the studio or at home, however, I tend to use a lead holder. It's not great for travel because the lead pointer gets filled with graphite dust and can make a real mess if you tip it over. You can track down a lead holder online or at your local art supply store. My nearby Michael's carries a Staedtler brand lead holder, as well as HB lead cores. Hobby Lobby, however, has a variety of lead cores. Perhaps this helps some of you out? I thought lead ratings were relatively common knowledge till I saw the light bulb go off behind Isaac's eyes when I explained these terms to him a couple of weeks back. I guess I'm in my own little world. Me and my pencils. Here's an investment with guaranteed returns. For $1.00, make a child's day with a box of colorful chalk. Leave the box on her bed with a love note. And that child's charming artwork will bring you far more than $1.00 of happiness. Take photos and your returns will double in the years to come when you both reflect on those sunny days of childhood. We haven't been able to fit in a family portait in years. At this point, I'm counting on Charlotte's artwork to catalog our family make-up. In fact, I dream of assembling a coffee table book of her artwork to help me endure an empty nest. I thought of naming the book 'I Love You, Mama' as this is the tag line on most of her drawings. My latest thought, however, is to name the book 'A Spoonful of Charlotte' as this mighty book is bound to help the medicine go down—the fleeting of time, a deterioration in health, vision issues—whatever is in store for me should I be fortunate enough to make it to a beautiful old age. I'm planning out my happiness. In fact, I've been giving a lot of thought to mindful happiness the last few years. I've been assembling my children's traditional keepsakes (artwork, report cards, photos, etc.) into files for their easy retrieval as adults. When I started, it struck me to include more meaningful things as well—bits of wisdom when they come to me, a love note for my far-off descendants—and my take on happiness and how to foster it. The more I move on it, the more convinced I am that everyone should leave such a guidebook for their kiddos. What to do, what NOT to do. I mean, isn't happiness the thing? So far, I have a handful of essays. Gosh, 'essays' sounds so—so what? Collegy? So far, I have a handful of studies. What's the word here? Though some stories are typed up, not everything is written out yet. I scribble down notes and test out my theories regularly. Some experiments are spiritual, some are physical, some are silly. Really, these are all excuses to be mindful about happiness because I believe mindfulness can make for powerful results. I made a list the other night of some of my sillier experiments with happiness and I realized that I should be including you guys in this. For instance, why have I not posted about my Cleaning Crown? Or video-taped a Family Dance-Break for you to laugh at? Though I did post about taking a Clogging Class with my friend, Sarah, and learning to Make Yogurt, I did not revealed my intent nor my impressions. The colored chalk was a simple plan to make the lessons I teach at my church a smidgeon more fun for the ladies. I wish I had thought to get an extra $1.00 box for Charlotte and leave it on her bed with a love note. That idea didn't crystallize till after we divied up my teaching supply and enjoyed a few minutes of scribbling on the driveway together. I'll have to surprise Charlotte with a new box of chalk in a couple of weeks when these others are worn to nubs. One tool we've learned we can't live without is an air-powered paint sprayer. This month alone we have painted up two huge work tables, a large dining table, two small tables, a chair, a chest of drawers and several frames. I should say, Isaac has painted up all of these things. I just ran the kids around and made all of the dinners so he could keep at it. For three weeks, our front driveway housed what looked like a terrorist interrogation tent, dusty tarps flapping in the wind. Isaac called it his "hobo shanty town." Painting this many pieces would have been misery with a paint brush and the finishes wouldn't have been so smooth and professional. Of course, it would have taken far less time if we weren't experimenting with some bullet-proof, professional paint Isaac tracked down. This stuff was rough to use, but the finished work tables are hard as glass. We used regular paint from the hardware store for all of the other projects and they were far easier to complete. We have refinished a ton of furniture over the last 15 years. I regret not getting an air compressor and a paint sprayer sooner. As far as air compressors go, for spraying paint, it's important to get a compressor that is large enough and powerful enough to keep up with you. Usually you would need, at minimum, a 20- to 30-gallon compressor for powering a paint sprayer because you are using the compressed air in a steady stream instead of in short bursts (as for a nail gun or staple gun). However, we have found that the 15-gallon DeWalt D55168 is up to the task. It has an extra-powerful motor and is capable of being filled to a very high pressure -- many 30-gallon compressors will only go up to 140 PSI (pounds per square inch), while this guy will go up to 200 PSI so it releases a longer flow of air than you would normally expect from a smaller tank. And it takes up less room. Furthermore, when we turned this machine on at the store, we found that it was also considerably more quiet than other models. Sold! Make sure to compare the SCFM ratings (Standard Cubic Feet per Minute) of the compressors you are considering, which measures air flow (into the tank, I think). For spraying paint, you will want a machine with an SCFM of 5 or more. Most air compressor tools will list what SCFM is needed to operate them, so look at the different tools you will want to use before choosing which model of air compressor to purchase. If you plan to use an air compressor for tasks that only require small bursts of air, like for a nail gun or a staple gun, then you might be able to get away with a smaller compressor. Read more about how to choose an air compressor here. In my opinion, the gravity-fed pneumatic paint sprayers (with the paint tank on top) work a little better than the siphon-fed ones. I haven't used enough different models to say which brand/model is best. Ours is a Husky Pro HVLP and we have been plenty happy with it thus far. Make sure to get a professional-quality respirator to wear while you're working. Woodworking projects sometimes call for a dowel or rod to be cut off at surface level. Power saws aren't usually up to the task and most hand saws, on top of too inflexible to stay flush with the surface, would damage the surface with their offset teeth. Enter the Japanese Flush-Cut Saw. This handy saw is not only rigid enough to make fine cuts in thin material, but also flexible enough to press tightly against the surface of your project -- imagine a long, metal spatula with sharp, toothy edges. The teeth curl back toward the handle and do not offset each other which means two things: one, the bottom of the saw is smooth and will not marr up your project; and two, it only cuts on the pull stroke. There really is no other saw that can do this job. Sure, perhaps only a handful of you will find need for such a device in the near future, but I love this thing, so there you are. And if you are in a family full of men, you now have a new topic to bring up at dinner. And there are birthdays and Father's Day to consider. Isaac calls this simple tool a "revelation." Funny -- I just noticed this -- ours has a stamp on the blade that reads, "For your pleasant life." How about that!? Chocolate is perhaps the best tool of all. Of course, if I was stuck on the prairie with bodies to clothe, food to procure, and a shelter to build, I may not think so. Then again, maybe I would. I've come to the conclusion that if I'm going to splurge, then I'm going to splurge. When I want chocolate, I want the good kind, not some cheap, grainy, make-your-mouth-sore chocolate wanna-be. Good chocolate, or no chocolate at all. Same goes for ice cream, cake, butter, mayonaise, and so forth. Why bother if it isn't any good? In the end, what real pain is there in spending $2 on chocolate satisfaction over $0.50 on chocolate disappointment? This is my thinking. My favorite, easy-grab indulgence is the Ritter Sport Butter Biscuit bar from Germany. It's creamy and dreamy. I'm sure there are plenty of other varieties that are just as delicious, but this is one of my all-time favorites AND the Target nearby has them displayed at their checkout stands -- which adds an undeniable convenience factor to the equation. When I'm feeling extra snazzy, I may even venture to the other side of the store to grab one of Ritter Sport's other varieties. They make a surprisingly fantastic Cornflakes bar and I'm ga-ga for their Marzipan bar as well. How about you? Who makes your favorite chocolate bar? Or, if you're not into chocolate, then how in the world do you get by? Do tell. Click on the image above to see the entire picture & description. It's Saturday! And I'm determined to spend a good part of my day outside. I'm either going to prune the rose bushes or clear out the garden to prep it for planting. It's stormy outside, so we'll see how it goes. Isaac is finishing up two big tables for the studio. (The same ones I mentioned last year. You know how that goes. They are looking awesome though!) After having at these reclaimed table legs with a palm sander for a while this morning (above), he gave up and purchased an orbital sander. This has made a huge difference, especially with the deep, turned contours at the top and bottom of each leg. The palm sander wasn't working too well on the rounded surfaces. The rest of the table parts he has built from scratch and everything is ready for assembly. These tables are HUGE and I can't wait to spread projects out all over them. I might have to try them out for napping as well. They are that big. What are you up to today? With the way the wind is blowing outside, I might be baking cookies and crocheting granny squares by nightfall. Cold-weather activities sound equally appealing. I'm in the home-stretch of a many-months' design project. With a name chosen, a logo and some final print-outs, my next fabric collection will head off to the mill and my brain will be my own again. I've been twittering as a welcome distraction. Next I'll need a new phone plan so I can twitter from anywhere. Then I can get input on whether to buy the yellow shirt or the blue one, have help choosing a dessert at the grocery store, or discuss any number of random ponderings while on the go. For instance, I've been thinking about Magic Shell a lot lately -- well, more than usual, which is never -- probably because ice cream consumption increases in direct proportion to an increase in workload. Magic Shell can't be natural. But, it sure tastes like chocolate and not as much like plastic as I'd expect. I twitter-tweeted my love of Magic Shell and WhipUp twittered me right back a link to a make-your-own-Magic-Shell recipe here. -- like pincushions, dolls, toys, etc. This simple tool is awesome. You can use it to push stuffing into just the right spot. And for teensy stuffed things, like doll fingers and noses, the small Stuffing Fork is great. If you poke the fork into a small tuft of stuffing and give it a twist, you can maneuver your stuffing bit in place. They really are great. We just stocked a handful of each size, large and small, in our store (10% discount here till April 5th). I have an old-school, wooden-handled Stuffing Fork that's been well-used and well-loved for the last decade or more. Now I've upgraded to these new ones which have a molded plastic handle and are even better -- a necessary tool for your sewing arsenal. And because April is upon us, I'm going to bullet-list out a few more tools I love, then call it done for the year. Totally random though. No rules. Color Munki. New tool for us. But you should hear Isaac's shouts of 'whoa!' from the other room. When you're in the design business, color calibration is big. Great Lash Mascara. Tackiest packaging, but good mascara. Beeswax for thread. For quilting or applique, if you run your thread through beeswax & press it before sewing, your thread will be stronger and will suffer less wear when pulled through the fabric stitch after stitch. I'll blog about this one in more detail sometime. Water-soluble markers. For marking match points or drawing tailoring adjustments in sewing. Or for drawing out an embroidery design onto fabric. Where were these when I learned to sew with chalky, messy, white tailoring pencils? Art Gum erasers. I have these erasers all over my studio. When I only had one or two, I'd lose them, or the dogs would chew them up. Isaac bought me 10 at once and now I'm all set. Having an abundance of good erasers is a luxury anyone can attain. Pentel Twist-Erase mechanical pencils. My new favorite pencil, because the eraser actually lasts for a while and can be re-filled. Of course, as a result, my art gum eraser collection hasn't been as important lately. Dave says this pencil has it's own following. Typepad. I've used Typepad from the beginning and have always been impressed with their interface, customer service, customizability, upgrades, etc. And I've never had a post go missing. This is the second or third time they've featured my blog on their sign-in page and I'm completely honored. Twitter. I've always described blogging as a form of conversation, and micro-blogging is even more conversational (see tweets in my sidebar). It's been less than a week since I started twitter-chatting, but what fun. Okay, so I'm off to polish up a logo for the fabric collection, then it's back to a more normal pace -- and a movie & a milkshake. Any movie recommendations? Okay, so Google Reader is the CLEAR winner. I checked it out and you can easily export the feeds you're following in another aggregator and then upload them to Google Reader. You can be all set-up and transitioned-over in less than 5 minutes. Dead serious. Then, if you install a Google Reader 'Next' button in your browser's bookmark bar, you can click from one new post to another and read each post in its original blog setting where it belongs. All great tips from you guys -- thanks for chiming in! Now I'm exploring Twitter. Ya, I took my time getting around to it. I think they invited me to the beta of Twitter three years ago or so. I'm getting serious deja vu on their site. Let me say, I love the simplicity of their concept. 'You know, for blogging.' Have you seen The Hudsucker Proxy (one of my all-time favorite movies!)? If not, then that's what you should do for fun this weekend. So Basic - But So Helpful! Years ago, when I posted a tutorial for My Favorite Knot, I thought it was a comically common thing to tutorialize. But, as that knot has made my sewing much more pleasant, I figured, "Why not. It's bound to help someone." To my surprise, that knot tutorial has sparked the most passionate feedback. Most of you probably already knew how to tie a tidy knot, but for those who didn't - ah, what a lifesaver! Today, my March of the Tools tool is similarly basic. And though quite well-known amongst bloggers, it shouldn't go without lauding: Aggregators. There are bound to be a few dozen of you who don't know what you're missing out on. This post is for you. If you find yourself tediously entering and re-entering the URLs of your favorite blogs throughout the day, just hoping that someone has posted a new entry, read on. You need an aggregator. I currently use Bloglines. Bloglines is a free, online service that allows you to organize and monitor your favorite blogs. When you are logged into your account, you are able to see when new entries have been posted on each of the blogs you 'subscribe' to. Subscribing to blogs is free and many blogs have a "Subscribe in Bloglines" or "Subscribe to this Feed" button in their sidebar to make the process even easier. (I just fixed my Bloglines button - it wasn't working right for months -- yikes.) Otherwise, you can click on a blog's RSS feed icon in your browser's address bar (usually looks like a little square with three curved 'sound' bars radiating outward - example to the right). The RSS icon will take you to the blog's RSS feed, where there are usually some subscription options, including Bloglines. Here is what my RSS feed page looks like. There are many similar services to Bloglines, such as Google Reader, My Yahoo, NewsFire, and many others. I've only ever used Bloglines, so I'm not too familiar with the alternatives. All such blog-subscribing services are called aggregators (or feed-readers, rss readers, news readers, etc.). Using an aggregator is an absolute life-saver if you're following a long list of blogs on a regular basis. An aggregator enables you to compose a virtual daily 'personal newspaper' of all of your favorite blog 'articles' (aka rss feeds or posts) which you can read one after the other right there under your account -- or you can click on a link to each post if you prefer to read new posts in their original setting within a blog (my preference). A lot of info? Let me just say it is totally worth looking into. The time you spend learning your way around Bloglines or another aggregator will easily pay off in spades. One hour learning how to use an aggregator could easily gain you three hours more free time in the next week or two alone. I knew about Bloglines long before I set up my own account. The day I finally did I was completely kicking myself for not doing it sooner. A seriously good tool. Isaac loves to cook. His sister, Evie, gave him a subscription to Cooks Illustrated magazine for Christmas one year and now we're hooked. I'm pretty sure I would never have picked up this magazine from the shelf of a bookstore. But it's great! Cooks Illustrated covers the science of cooking in a fun, easy-to-follow format. In any given issue, you might learn how to best hard-boil an egg so the yolk stays centered (helpful for deviled eggs), or which brand of stone-ground mustard is the most flavorful, or the science behind aged cheese. Who knows -- all kinds of interesting things. Their test-kitchen cooks tirelessly compare techniques and recipes to arrive at the best methods and flavors. Then they quickly outline their test results and make suggestions in the magazine. Even better, their research and info is completely unbiased - like Consumer Reports for cooking techniques, food, & recipes. The magazine doesn't have any ads and is illustrated in old-fashioned pen-and-ink-drawings, which I love. Anyhow. Yes, I'm recommending a cooking magazine as a favorite tool for March of the Tools. Next time you're out shopping, stop by the magazine row and take a peek through Cooks Illustrated. I love knowing the 'why' behind a good recommendation. And Cooks Illustrated is full of 'whys' -- and good recommendations. This gadget is awesome. It's a Belkin TuneTalk™ Stereo voice recorder for iPods. When you plug it into the bottom of your iPod, you can record voice memos in a snap. And there's no set-up or anything. When the voice recorder is plugged in, a new category called "Voice Memos" shows up right on the main menu. To run the recorder, you simply use the iPod's scroll-wheel and select button to follow the prompts on the iPod's main screen. I picked this device up at the Apple Store for a business need. It wasn't cheap - maybe $60 or $70? But, once we heard the recording quality (which is surprisingly fantastic), Isaac & I have since used it for video voice-overs and for recording our children's sweet little voices - while they're still sweet & little. The voice files created are easy to move into the computer for storage as well -- they import right into your iTunes library. I highly recommend it. See your local Apple Store for more info. And, here's a current list of iPod models this recorder should work with. I have been so sick this week. I keep thinking I'll kick it and be back in action, but it's still dragging on. After a good night's sleep tonight, I'm hoping to have my writing mojo back and start into a condensed March of the Tools. 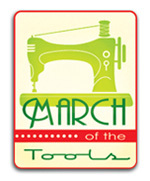 Till then, make sure to visit the March of the Tools page where you can see who all is participating. A lot of excitement for tools! Found my card reader. And I'm doing what I can to hop back on the tool train too. 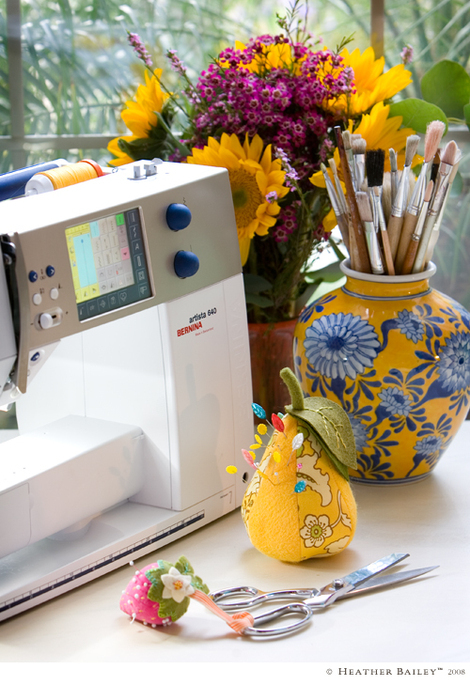 I receive regular requests for sewing machine recommendations, but am a little shy about recommending a starter sewing machine as I've been entirely spoiled on the sewing machine front and haven't had to shop for a starter sewing machine for, well two decades almost & I'm not that old! I have three sewing machines and two sergers. My newest machine is a Bernina Artista 640. The coolest thing about this one is that I can design embroideries on my computer & then stitch them out at will. Of course, I confess, I've only done this once so far. But that's because I've been designing more than sewing in recent months. (Isaac wrote an article for Sew News about how to interface with these machines if you're a Mac user & not on PCs. The embroidery I designed for that article is available as a free download in my sidebar under "Free Embroidery File.") Anyhow, I'm not up to a comprehensive, statistical review, but I can say that Berninas are a very pleasant machine to sew on. Speaking of Berninas -- Quick story -- Partway through my Apparel Design degree our workshop space was re-outfitted with an army of new Bernina 1620s. Reading through the manual late one night (many all-nighters were pulled at school - Project Runway pretty much wraps up the experience), there was a mention of 'memorized buttonholes,' but the instructions weren't clear what exactly those were or how to set the machine to do it. Oh, but the idea of 'memorized buttonholes!' I proceeded to poke & prod & tap out all manner of button sequences before I was successful. I think it took me an hour or so to break the code. Completely worth it! And, of course, I got to be Santa Claus the next day showing my friends that new technology. We all took a renewed interest in buttons that season. Anyhow... sewing with a quality machine is really important, especially if you're new to sewing. I've taught many people to sew who were originally convinced they were stinky sewers. In every case I recall, it was their cheapy cheap sewing machines taunting them. The machines would lock up & the threads would get all tangled. Hands in the air, "I stink!" I'd re-thread the machine & get them going again, only for the machine to grunt & groan once more. "My friend, it's your machine that stinks! Here, try mine." "Oh, hmmm, maybe I can sew." Yes, I've witnessed this many times. Of course, you don't need that Cadillac up there in order to be successful either. Most new sewers should look for a machine with a straight stitch, a zig-zag stitch, buttonhole capability, back-stitch button, ability to change needle position, interchangeable feet, etc. But go with one of the better brands. (Can't say just which models though as I haven't researched any of this lately.) Get a good quality machine so you're more likely to succeed & to like yourself as a sewer. Otherwise, just know that if you're learning to sew with a $50 machine from the drugstore that half of your sewing battles are not your fault. Blame the machine. That works too. And don't give up sewing! • Viking #1+ Sewing Machine - Not as new as the Artista 640, so it's not in prime position anymore, but I still like this machine a lot. This is the machine I take out when a friend comes over to sew. And I like to do buttonholes on this one too (out of familiarity, I think). • Bernina 840 Sewing Machine - Old machine. It was old when I got it too. But it has metal parts! And everyone I've ever heard discuss this machine has given it the - same - exact - nickname -, "workhorse," which really weirds me out. 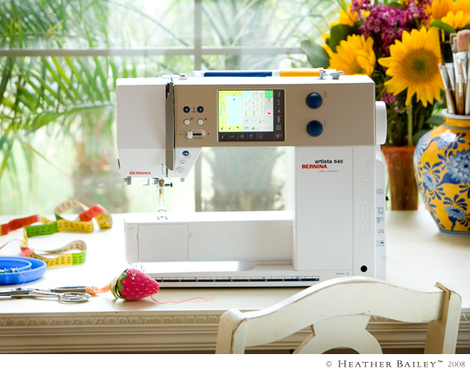 I've lent this machine out to many friends who were learning to sew. And this is the machine I do all of my upholstery and slip-cover sewing on. It's not an industrial machine, but it's tough. • Bernina 2500 DCET Serger - Haven't mastered this one yet, but it does all of those cool hem stitches for sewing with knits. I like to keep this one set on a cover stitch and use my other serger for overlock, so I don't have to switch the threading around too much. See, totally spoiled. • Bernette 234 Serger - I love this serger. Just a good, straight-forward machine that's easy to troubleshoot. Perhaps its our history though. Loyalty. I bought this one used. It was the summer I turned 20. I had already survived one fashion show in college (huge collection, one-of-a-kind hand-sweaters too, so tiring!) & I knew I'd be putting together another collection the following year. This serger was my ticket to sewing at home & pulling fewer all-nighters at school (yes, those were crazy-fun, but I was newly-married & trying to be more sensible). It was $200 or $250 at the time, which was about as much as we paid in rent, but neither of us flinched. It was a good call. So, those are my machines, a couple of which came as presents from my generous MIL who opted to be paid in machines in exchange for design work (machine embroidery, I think) over the years . She's just about outfitted all of her daughters with top-of-the-line machines now. Ridiculously fabulous & indulgent pursuit, don't you think? Yes, there were times when my sewing machine was worth more than my car. Not the nicest cars back then though. I'll take some photos of my other machines & mix them into this post later this week to break up all this text. I could probably go on, but I'm actually sewing today & am anxious to get back to it. I'll upload some N.Carolina photos for next time too. Probably the most-used, most-carefully-placed tool around here, the sketchbook. Not to be lost. When one fills up, there are several new ones on hand, ready to go. Small one for discreet sketching, at meetings or whatnot. The spine of my latest sketchbook has developed leprosy or something so I'm giving the spiral-bound a try. If the pages stay in then I'll convert. "I get a lot of questions about the equipment I use to create the photos that you see on my website, which is the same equipment used to create photos for this blog. First of all, let me say that Heather is quite a good photographer and does 99% of the photography for her blog herself. 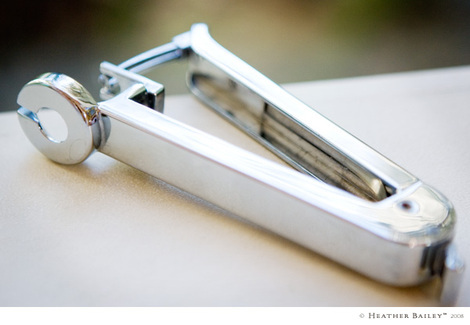 That being said, we do share the same equipment and since it is March of the Tools, I thought I'd chime in and share one of the tools that makes my style possible. There is no substitute for a good eye and an active, observant imagination, but certain looks just can't be achieved without the right tool. 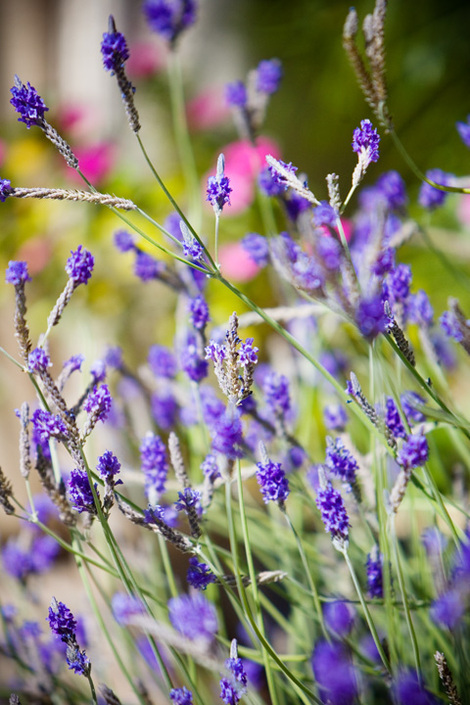 When I want to get the effect in the photo of the lavender flowers, where the flowers in the foreground are the only thing in focus and the background seems compressed and close, I use my 70mm to 200mm f2.8 lens. Set at it's longest focal length of 200mm, this lens all but eliminates depth of field. Depth of field is the distance between the first object in the foreground that is in focus and the last object in the background that is in focus. The depth of field is determined by two properties, the focal length of the lens (longer focal lengths -- telephoto lenses -- have less depth of field built in) and the aperture of the lens (f-stop) which is the size of the opening that lets the light into the camera. 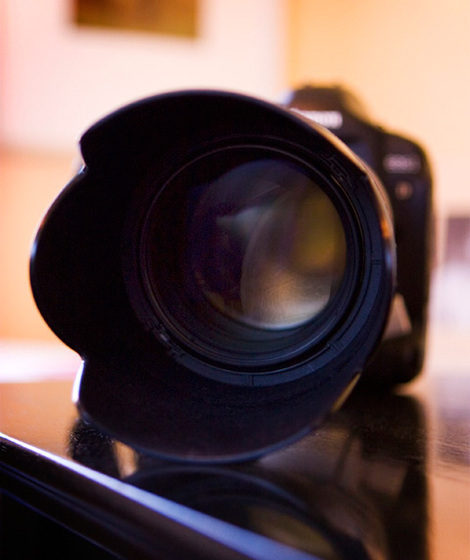 A very fast lens like this one opens very wide and hence has very shallow depth of field. A third factor in the look is the effect of compressing the foreground and background, which eliminates a lot of extraneous details from the shot and has the effect of making shots look tightly-cropped in the camera. This is a result of the length of the lens -- imagine looking through a long tube where all peripheral vision is eliminated. The 70-200 mm f2.8 lens is a bit pricey, but for the serious amateur or pro, it creates a look that can't be replicated by other lenses. While you will not be able to fully achieve this look with a point-and-shoot, try setting the camera on macro focus (it's usually the little flower icon), zoom in as far as your optical zoom will allow, then back in and out until you find the absolute closest place you can focus. By the way, thank you for all of the compliments on the MEHC article. That was a very intense and fast paced shoot, but extremely fun!" All of this camera talk reminds me that I never showed you the slideshow from Heather Tinsley's wedding (click here). 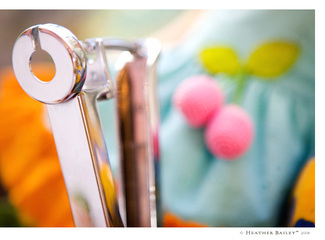 Heather is a blog reader who flew Isaac out to photograph her wedding last December. Love that! Hi Heather. It was in D.C., I think, as Isaac went to the Spy Museum the next day. The Spy Museum! Can you believe there's a spy museum? I wonder how much James Bond reflects reality -- or vice versa. There's certainly nothing discreet about that camera lense up there. 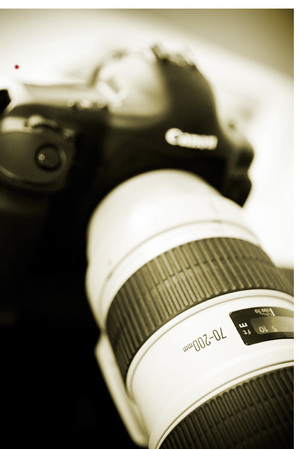 I usually use a smaller 24-70mm f2.8 lens because the other one makes my arm ache. They both have a similar effect in my opinion. Similar enough (don't tell Isaac I said so). This little box of watercolors is no bigger than 5" x 6" and is extremely handy if you're a must-make-something-at-all-times kind of person like I am. (My soda should give you some idea how small it is - I threw that in there for scale). This tool is easy to grab & ready to go, whether to Granny's house, on a family vacation, or on a business trip. And I really enjoy painting from watercolor pans (those rectangular cubes of color). Sometimes I just want to get to it & paint, without having to fuss with lids every time I need a new color. It's been a while since I've done much with watercolors or shown you any of my watercolor work, but this is still one of my favorite little things to have around. This set is by Windsor Newton and is called "Cotman WaterColours: The Compact Set." I think they're available at Michael's. And here are a couple of online stores that sell them as well: CheapJoes, FineArtStore, & KenBromley(UK). I'm jumping price brackets from my last March of the Tools post. 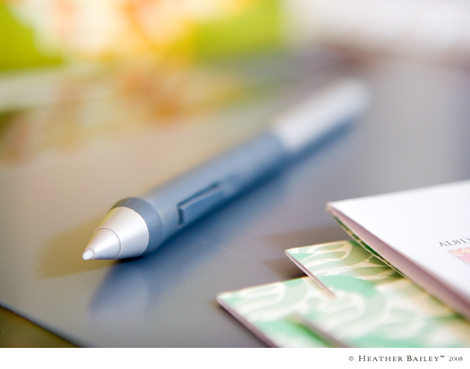 But, whatever the expense, here's a tool I absolutely couldn't do without: the Wacom tablet. This tool allows you to forego your computer mouse for a stylus (penlike tool below). Some artists will use the stylus & pad to draw or paint images right into the computer and for such an approach the Wacom is invaluable. I, however, do all of my initial artwork outside of the computer, so the Wacom's obvious benefit of more authentic art isn't my main reason for affection here. 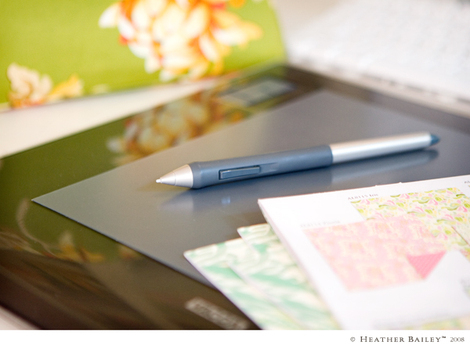 In fact, it is really my right hand that's in love with the Wacom. Intense work on the computer with a mouse can make your hand cramp & throb after endless hours of clicking & dragging & clicking & dragging. Working with a stylus is just a lot more comfortable. A lot more! And there are some pretty cool secondary features too. The graphics tablet is pressure sensitive. So, if you have an art program that's compatible with this feature, you'll find that with some paint brush tools a stylus will create a varied stroke in response to the pressure you apply. This is the case with Painter, Illustrator, etc. No settings to change. A normal computer mouse will just produce an even line. The buttons in the corners can be programmed to do whatever functions you regularly use. And the longer rectangle (see top photo) allows you to zoom or scroll if you stroke your finger across it. I have my buttons disabled as I'm all about key commands. But I still think they're cool. So that's the Wacom. I have one huge tablet, as wide as my keyboard, and a smaller one to take with my laptop. As I said before, I couldn't do without it, so I had to have a second one for travel. I love tools. Tools that make life better, work easier, and fun funner. I get a lot of questions about which sewing machines I have, what camera equipment I use, etc. 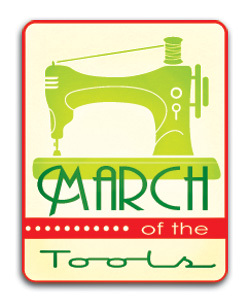 And seeing as I haven't put together my FAQs page just yet, I thought I'd embark on a new theme for the month of March... March of the Tools. Work tools, food tools, sewing tools, whatever tools come to mind, but all tools that I love & use. To kick things off, here's one of my favorite doo-hickies - only the best cherry pitter ever. My sister picked this up for me at Williams Sonoma (I think) a number of years ago. No other cherry pitter will do. You just place a cherry on top of that "O" and squeeze. The pit comes shooting out the hole. Just make sure you wear an apron and do your pitting over the sink into a bowl. (Oh look, here's one with a splash guard.) Nothing's more indulgent or delicious than sitting down to a bowl full of pitted cherries, washed and ready to eat. I swear, cherries are ambrosia & nectar in one - food of the gods. And with cherry season well behind us, I resorted to the crocheted-cherry detailing on one of my dolls to set the proper fruity mood here. Not quite so photogenic as real cherries, but I saved myself from a serious cherry hunt, so humor me. The parading tools will likely include some things silly, some serious and some expensive. No bragging intended, just some dang good tools you might want to know about. 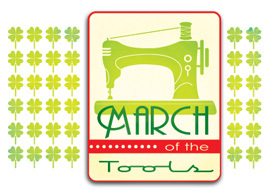 Want to join me on this March of the Tools? I'd sure love the company. And the tool recommendations. If so, here's a badge you can post in your sidebar. Link back to this post, so your readers will know what's up. (If there's some trickier/better way to do badges, certainly let me know.) This one is 150 dpi, or you can use the 250 dpi one here, or snag the clovered-up version from my sidebar. Add your link in the comments below so we all know who's playing along. Then we can all click over to your blog throughout the month to see what sort of tools we're missing out on. And join the March of the Tools Flickr Group (great resource for next year's Christmas list, I'm thinking). That's my 76 trombones. Cornets or not, I'm marching.